Today’s Groupon is for 8 Food Carts all over the Portland Area. If you have never used Groupon before just add your email and the deals will come in daily. There is no obligation to buy. I have used them several times and love them. Even if you don’t have a Groupon, Food Carts are a great way to eat some amazing food for a fraction of the price. Cart made pasta that tastes better than most restaurants. Cheese plates that will leave you saying “This came from a food cart?” You will even find some great breakfast carts that serve hollandaise sauce that will rival or even beat many restaurants in town. 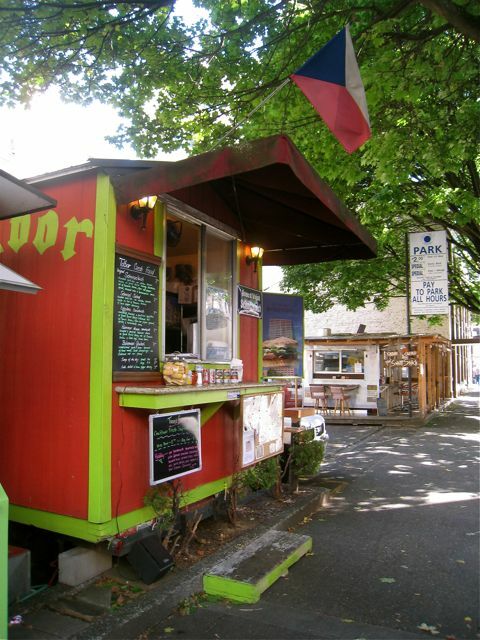 Everyone in Portland knows how big the Food Cart scene is here. I have been to some myself and just love the variety. Some people get overwhelmed with the pods that are in downtown Portland. There are many gems tucked away in there, but for starters head to NE Portland on a Sunday afternoon and hit the pod at NE 23rd and Alberta. You might be greeted with some funky jazz music, a fire if the season is right, 3 great food carts, a dessert cart and a beer cart. Grab you food and sit under the covering. It keeps the sun off in the summer and the heat in in the winter. 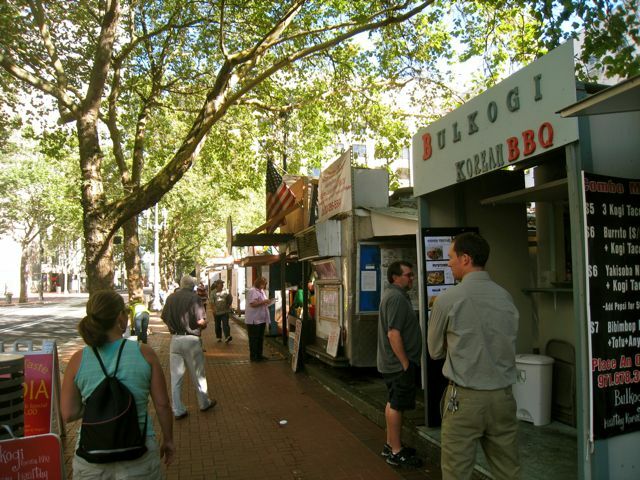 Food Carts are a great way to Eat Your Way Thru Portland. That is so fun. I read your entry about the schintzel sandwich and it sounded sooooo good. That sandwich was so huge it could have easily been shared. Although it was rather messy and there is no way to cut and no way to really share it. So I ate it all.